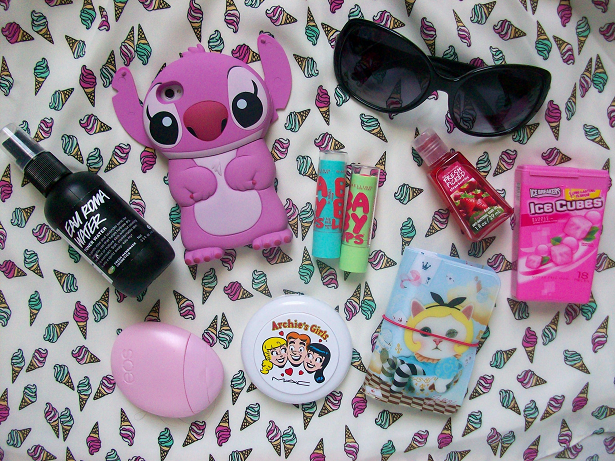 MooeyAndFriends: What's In My Bag? Today I will bee doing the What's in my Bag thing. I've been wanting to do this post for a while but I didn't have that much to show for a while (I don't like carrying bags so I never really know what to carry) but finally I have some interesting things to show! So yeah, lets see what I carry in my bag! LUSH Eau Roma Water: I like to keep a spray toner with me just in case I need to freshen up my makeup/face when I'm out. 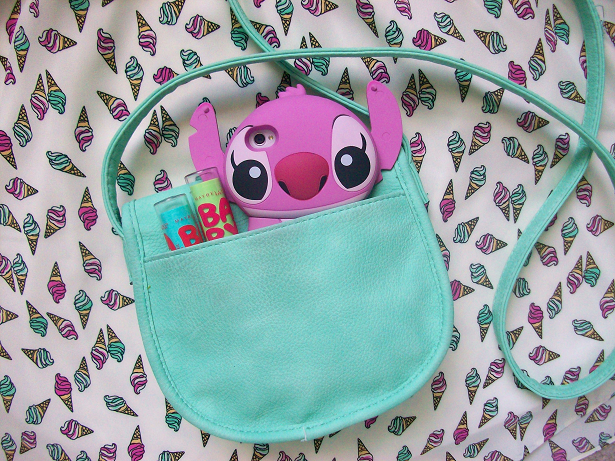 iPhone with Pink Stitch Case: Of course you need your phone! I change my phone case almost every other day. This pink Stitch case is my current favorite! Alice Cat Card Wallet: Recently I got this card wallet in the mail, I got it from eBay. I mainly use cards but I do have a few dollars squeezed in the side pockets. Strawberry Scented Anti-Bacterial Hand Gel: To keep my hands clean and sanitized I keep this strawberry scented hand gel that I got from Bath and Body Works. 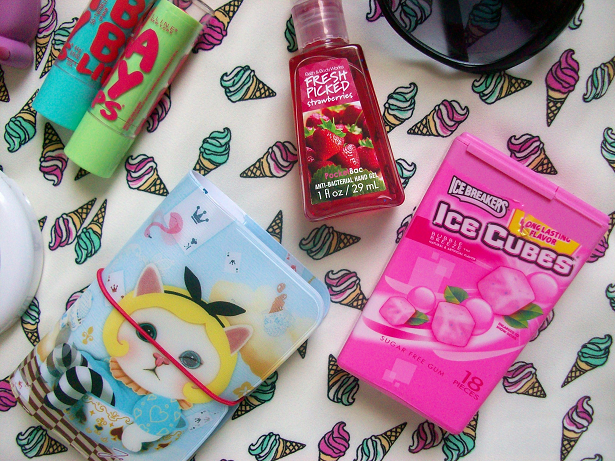 Ice Breakers Ice Cubes Gum in Bubble Breeze: I saw these at the supermarket the other day and freaked out! I use to chew this gum all the time when I was in middle school and now they are selling them again in tons of flavors! I picked up the bubblegum flavored one but I'm going to try out all the flavors! EOS Hand Cream in Berry Blossom: When my hands get dry I use this berry scented hand cream. Smells yummy! 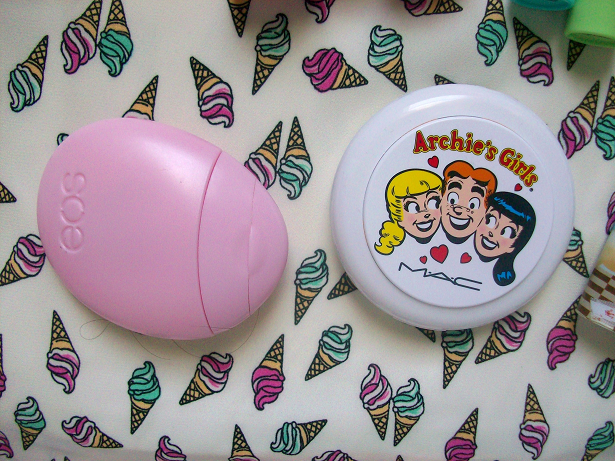 Archie's Girls Beauty Powder in Flatter Me: This compact comes in handy when I need a mirror. Sunglasses from Forever 21: Sunglasses never usually fit in my tiny shoulder bags so I end up carrying them with me. Maybelline Baby Lips in Twinkle and Melon Mania: I change my lip products depending what I'm using or loving at the moment. These Baby Lips are my current favorites. 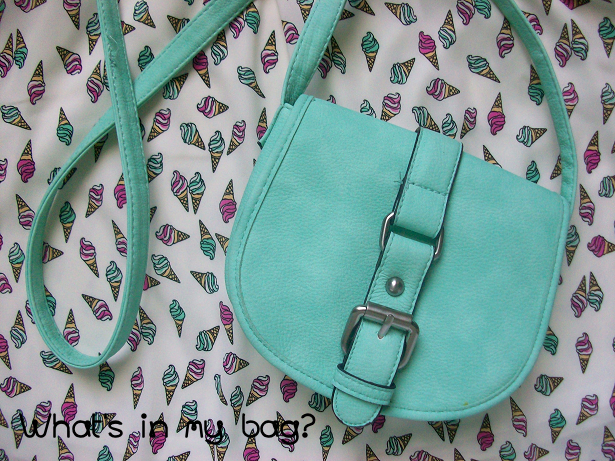 I love that bag. Oh and your phone case is too cute!